Mayhem erupted in the Turkish parliament after an MP handcuffed herself to the rostrum in protest at constitutional reforms that would put more power in the hands of President Recep Tayyip Erdogan. Independent lawmaker Aylin Nazliaka’s actions sparked clashes between opposing sides of the house at odds over Erdogan’s measures to extend presidential control. Turkey has been in a state of mounting crisis since a failed coup attempt in July. Turkey’s parliament has already approved a number of articles for reform, but if fully passed, the new legislation would mean that the president can appoint ministers and chief state officials, issue decrees, dissolve the parliament, and rule Turkey until 2029. Erdogan claims that the legislation will provide stability at a time of turmoil, but critics say, however, it’s too much power in the hands of one person and could pave the way towards an authoritarian state. 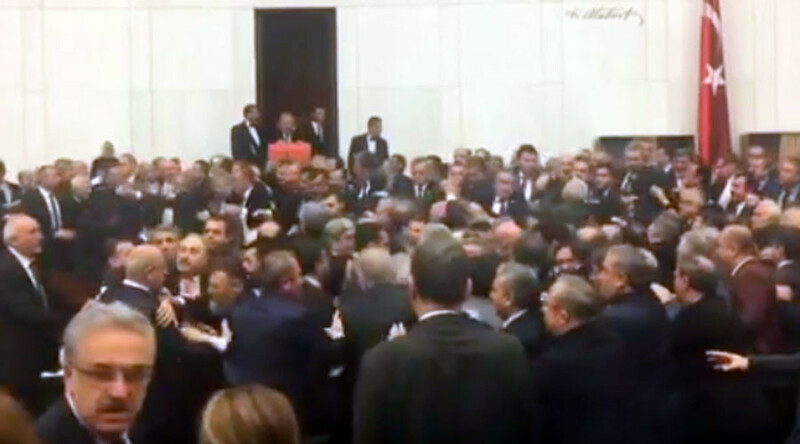 The Turkish parliament is no stranger to violent clashes, with scuffles breaking out last week when an MP tried to film a voting session. Turkey has been in a state of emergency since a foiled coup attempt in July, leading to the expulsion of tens of thousands of alleged conspirators from government posts.